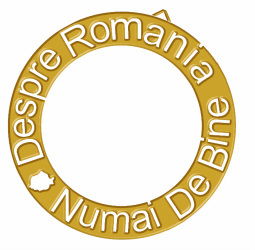 “All the best about Romania” is a project created by director Ana Mărgineanu and playwright Peca Ştefan which has materialized through a series of performances –portraits of Romanian towns. 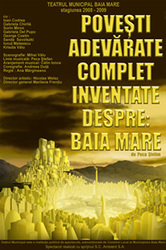 The shows are the result of research made by the artistic team (actors, playwright, director) regarding the local contemporary life of one specific Romanian town and aiming to get the people living in their community closer to their town. The creators are interested in discovering the specific legends, myths of that community, from very concrete data to folklore, but have as their main concern the life in the present – which are the main concerns, wishes, the problems of the people – both in a collective and particular way. 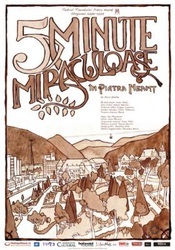 The theatrical “mapping” of Romania, which began in 2008 in the town of Baia Mare (with the show “Completely Invented True Stories about Baia Mare”), continued in Piatra Neamţ in 2009 (with “5 Miraculous Minutes in Piatra Neamţ” – which was awarded the Irish Embassy Award for Best New Romanian Play of the 2009 – 2010 season, and Best Performance at FestCO 2010 – at the Comedy Theatre in Bucharest) reached its third stop in the birth town of playwright Peca Ştefan – Târgovişte. 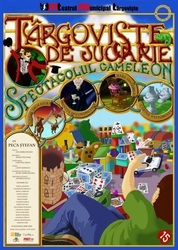 What Peca and Ana Mărgineanu discovered here in their research can be found under the title “Playful Târgovişte” – in almost all the spaces of the Târgovişte Municipal Theatre (halls, foyer, dressing rooms, rehearsal room), simultaneously, in the shape of a “chameleon show”. “Playful Târgovişte” is made out of 18 performances of 20 minutes each, which play simultaneously in 6 spaces (5 fixed spaces and one mobile), offering the spectator the possibility of making his or her own route and thus building their own performance.